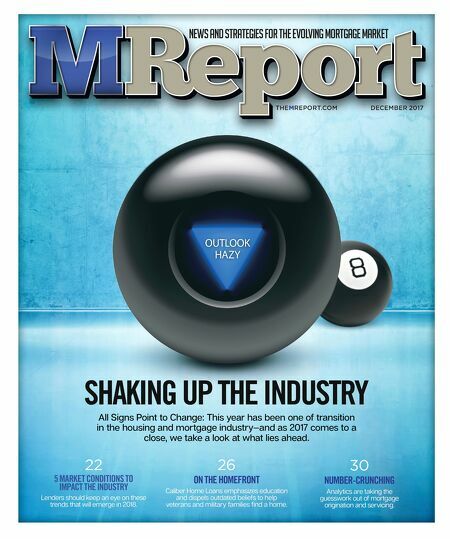 news and strategies for the evolving mortgage market DECEMBER 2017 THEMREPORT.COM SHAKING UP THE INDUSTRY All Signs Point to Change: This year has been one of transition in the housing and mortgage industry—and as 2017 comes to a close, we take a look at what lies ahead. OUTLOOK HAZY 22 5 MARKET CONDITIONS TO IMPACT THE INDUSTRY Lenders should keep an eye on these trends that will emerge in 2018. 26 ON THE HOMEFRONT Caliber Home Loans emphasizes education and dispels outdated beliefs to help veterans and military families find a home. 30 NUMBER-CRUNCHING Analytics are taking the guesswork out of mortgage origination and servicing.